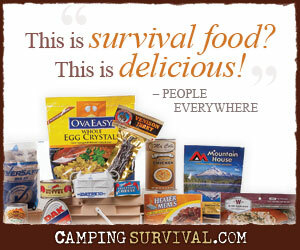 When it comes to prepping and survival, there are many important skills that the prepper can and should learn. Administering first aid, foraging for wild edibles, navigating difficult terrain, and preserving food, immediately come to mind. In my opinion, fire making may be the single most important skill that a prepper or survivor can possess. Why? When fire is available, your opportunities are greatly expanded. Consider some of its many varied uses. You must be skeptical of almost all water sources available to you in the wild. By some estimates, 1.8 million people die each year from diarrheal diseases brought on by contaminated water. Even clear, fast moving water can host parasites such as Guardia and Cryptosporidium that can disable or even kill you. Boiling water for at least one minute will effectively kill any microscopic organisms that may cause you intestinal issues. Nuts, berries, and other wild edibles can certainly help provide a survivor with the added nourishment that his body so desperately needs when effecting survival. However, it’s extremely difficult maintain the caloric intake your body solely on wild edibles. For longer term survival, you’ll need to look to other food sources such as birds, fish, small mammals, and even worms and insects. Having a fire to cook these animals over will help to eliminate any parasites before you consume them. Even a small fire helps to provide peace of mind when you hear things go bump in the night. A camp fire brings a sense of security and well being. And that can be priceless when alone in the woods. You can also make small torches to use as a makeshift flashlight. Try as we might to be careful, accidents happen. And some of those accidents may require the use of medical instruments such as a needle for stitches or forceps for removing an object from a puncture wound. Sterilizing the instruments will not guarantee that infections won’t set in, but it will improve your odds. Instruments can be sterilized by boiling in a container of water or by holding them directly over the fire. Most animals are more afraid of us than we are of them. But there are exceptions. And these animals may just be hungry or territorial enough to attack. The presence of a fire in your campsite may help dissuade them from their intentions. When lost, or when searching for someone who is lost, you quickly realize just how big the world is and how small we are in comparison. Searching for a single person in a 100,000 acre national forest is not easy. Building a bright fire at night and a smokey fire during the day expands your signature and helps rescuers locate you. Fire can be used to fashion tools that will enhance your survival experience. The heat of a fire can be used to fire-harden a stick into a much stronger device that can be used as a spear, shovel, or animal trap. Hot coals can also be strategically placed on pieces of wood to hollow out bowls and spoons. Hardwood ash and charcoal from a fire can be used for a number of purposes in survival situations. Eaten in small amounts, charcoal can help to settle an upset or overly acidic stomach. Ash is also a key ingredient in primitive soap making techniques. Of course, one of the most important and obvious uses of fire is to help keep you warm during a cold winter’s night. Building a fire near your shelter can help provide you with the heat you’ll need to survive the night. Better yet, you can bury hot coals beneath your sleeping area to warm the earth under you. Getting wet during the winter months can spell disaster for you. Whether you’ve fallen in water, gotten wet from snow on the ground, or sweated while working, damp clothes can hasten the onset of hypothermia. Drying your clothes next to a nice, warm fire can help protect you from heat loss due to evaporation. Can you start a fire when it’s windy? And cold? After a rain storm? Using materials from your Every Day Carry kit? The ability to make a fire under a wide range of circumstances is important, if not critical, for many survival situations. At best, it can save your life. If nothing else, it can make the experience much more manageable or even enjoyable. So, what are you waiting for? Practice building a fire. Use a ferro rod to light your next charcoal fire. Make a fuzz stick and skip the starter logs when lighting a fire in your fireplace. Teach your kids to make a fire with a magnesium block or using steel wool and a 9-volt battery. Practice before you need the skill. Cold and wet with little daylight left is no time to learn that it’s harder than it looks. So, what do you think. Is anything more important than fire? One thing I like to freak new campers out with is by throwing ashes and water in the frying pan with grease. They always say, “Why did you just do that??? It’ll be harder to clean now!” They don’t realize that it makes a watered down form of lye that helps clean the pan. Just be careful you don’t make it too strong! Couldn’t agree more about practicing either. Once you know how to build a fire go out on a rainy and windy day and you’ll find it’s a whole different story. I’ve built fires under just about every weather condition and it’s always a learning experience. I’ve had my share of failures too. Always treat it as a learning experience. Use a firesteel. Once you can build a fire with a firesteel building one with a match is ten times easier. Thanks Jarhead. Reminds me of an old football coach I had. He said that practices should be so hard that the games feel easy. If you can start a fire in adverse conditions with firesteel, starting one with a match will be cake. What is a fuzz stick? Good question, Vikki. A fuzz stick is a stick that you’ve carved to help start a fire more easily. The trick is to cut into the stick at an angle with your knife. Leave the pealed back portion attached to the stick so that it’s flared out and can ignite more easily. Do this down the length of the stick so that it whole stick can catch fire more easily than it if was smooth. A picture is worth a thousand words. I’ll write a short post about making one soon. I love your site! I try to be as “Pre – Pare – Anoid” as I can. One “sure fire” way of starting a fire is to use carbide chips. A couple of small carbide chips will burn in a pile of snow without any other fuel. I have done it and it is easy: add water to carbide chips and you have acetylene. It is very, very cheap, lights easily, burns hot, burns in water and weighs nothing. Carbide lamps have been used by miners, etc. for a long time. They are filled with carbide chips and have a reservoir for water. The water drips onto the carbide and the acetylene gas is released. A friction wheel and flint that are attached to the acetylene cylinder provide a built – in way to ignite the gas and focus the lamp. It produces a brilliant flame for a long time with very little fuel.